The way the cosmetics industry views human hair is set to change, thanks to a new discovery from a team of crystallography researchers. 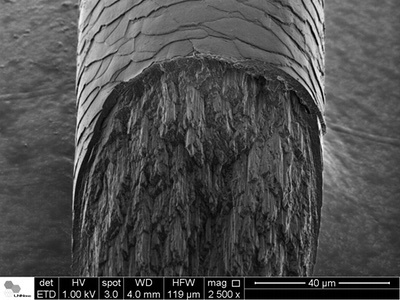 The US and Brazil-based team used a combination of submicron X-ray beams and cross-section geometry to study the structure of hair, finding new features. Their discovery was shared at the American Crystallographic Association 2015 Meeting last week in Philadelphia, US. The team found a previously unobserved region of the hair located in the cortex, near to the cuticle boundary. “We also discovered that within the cuticle a key diffraction feature of the alpha keratin is absent – indicating the presence of beta keratin instead of the alpha keratin phase,” Stanic added. Previously, scientists had accepted that keratin was only found in its alpha conformation.